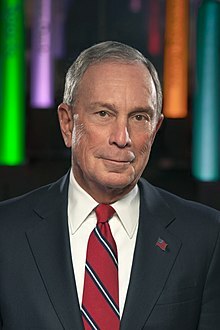 1st & 4t CEO o Bloomberg L.P.
Michael Rubens "Mike" Bloomberg (born Februar 14, 1942) is an American business magnate, politeecian, an philanthropist. His net worth is estimatit at US$42.7 billion, as o October 2016, rankin him as the 6t richest person in the Unitit States an the 8t richest person in the warld. ↑ "Michael Bloomberg profile". Forbes. Retrieved August 28, 2016. ↑ "About Mike Bloomberg". mikebloomberg.com. 2015. Archived frae the oreeginal on July 12, 2016. Retrieved July 31, 2016. This page wis last eeditit on 3 Januar 2017, at 17:59.